The book of Ezra tells us how after 70 years of Babylonian captivity the Jewish people returned to Judah and rebuilt Jerusalem temple. Rebuilding of the temple was quite complex process. Due to various circumstances the rebuilding of the temple in Jerusalem permanently delayed. Starting at the first year of the Persian king Cyrus the rebuilding of the temple ended only in the sixth year of Darius the king. In the first chapter of the book (so called Story of Sheshbazzar) the Persian king Cyrus the Great issued an order and allowed the Jews return to Judah and rebuild the temple of Yahweh in Jerusalem. 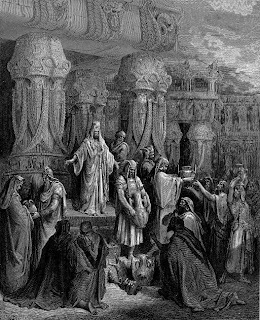 Then Cyrus sent to Jewish ruler Sheshbazzar the temple vessels which Nebuchadnezzar king of Babylon brought from the temple of Solomon before its destruction. In the following chapters of the book is given a list of people who returned from captivity and described the beginning of the process of rebuilding the temple. But in following chapters nothing is said about Sheshbazzar. In the next chapters of this book the main characters are Zerubbabel the governor, Joshua the high priest and Ezra the scribe later. Nothing is said about what happened with temple vessels which the Persian king Cyrus gave Sheshbazzar through his treasurer Mithredath. Consequently, the book contains a puzzle. Whither did Sheshbazzar disappear? And where did he put the temple vessels that he brought from Babylon? Biblical scholars who explore the book of Ezra note that in this book the Story of Sheshbazzar is incomplete. After the story about the receiving the temple vessels of Sheshbazzar and return from Babylon this story ends. The next story in chapter 2 contains a list of those who returned from captivity. But such leader as Sheshbazzar is not mentioned on this list that contains 42,360 people. Therefore, scholars believe that the first chapter of the book of Ezra (the Story of Sheshbazzar) has preserved in the corrupted form. And in order to solve our puzzle, we must restore the original form of that story. Then we can answer the question where did Sheshbazzar put the vessels of Solomon's temple? We will try to restore this chapter. 1. In the first year of his reign Cyrus the king issued a permit to rebuild the temple. 2. The leaders of Judah and Benjamin, priests and Levites responded to this permit. 3. Their neighbors helped them financially. 4. King Cyrus gave the temple vessels to Sheshbazzar. 5. Sheshbazzar brought the temple vessels from Babylon to Jerusalem with all exiles. "Sheshbazzar brought them all up with the exiles who went up from Babylon to Jerusalem. (Ezra 1:11 NAS)"
3. Exiles returned to Judah. 4. Other inhabitants of Judah helped them to do something. 5. King Cyrus gave the temple vessels to Sheshbazzar. 6. Sheshbazzar brought the vessels from Babylon to Jerusalem and placed somewhere. According to the original chronology the exiles returned to Judah before the return of temple vessels. After return the exiles other inhabitants of Judah helped them with gold and silver, horses, cattle, jewels (by order of Cyrus the king). Then the exiles did something that is not present today in the book of Ezra. After that, the Jews made a sacrifice (as in the book of Josephus). And only then Cyrus handed over the temple vessels to Sheshbazzar. The account what did Sheshbazzar do with this vessels is also absent in the text of the book. A hint of what did the Jews do at Jerusalem led by Sheshbazzar is contained in another part of the book of Ezra. There is an account that Sheshbazzar laid the foundations of the temple in the letters to King Darius from Tatnai and Shetharboznai, the governors of Beyond the River. But in another part of the book there is an account that Zerubbabel laid the foundations of the temple. Therefore we can assume that in the first chapter of the book, which describes the activities of Sheshbazzar, it has been removed the reference of the laying the foundations of the temple. This reference could be deleted because it contradicted with other stories about laying the foundations of the temple of other character (Zerubbabel). The book could not contain two different accounts about the laying the foundations of the same temple, so one of these accounts had to be removed. But even this assumption does not remove all contradictions. The question remains, where did Sheshbazzar put the vessels of Solomon's temple? He had to place it into the temple. In terms of the sequence of events would be logical to assume that the transmission of temple vessels would take place after rebuilding the temple in Jerusalem. Why did Cyrus hand over the vessels if there was no place to put them? According to Septuagint Cyrus handed over the temple vessels when the temple was already built! The above quote from Septuagint is a trace of the previous edition of Sheshbazzar story. 4. Other inhabitants of Judah helped them to build a temple. 6. 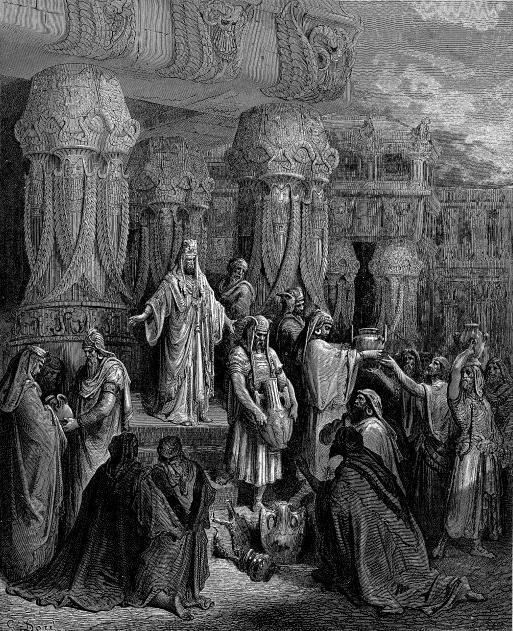 Sheshbazzar brought the vessels from Babylon to Jerusalem and placed them in the temple. How could it be? After all, the temple was built by Zerubbabel in the sixth year of Darius the king! Obviously, Sheshbazzar story once was short, completely independent story, in no way connected with the stories of Zerubbabel, Ezra, and Nehemiah. It was the story with complete fulfillment the prophecy of the books of Jeremiah and Isaiah. The book of Jeremiah contained the prophecy about 70 years of captivity, and the book of Isaiah contained the prophecy about the Lord's anointed Cyrus, who will rebuild the Jerusalem temple. In the story of Sheshbazzar these prophecies successfully implemented. The exile lasted 70 years, King Cyrus came to power, and in the first year of his reign he allowed Jews to return from exile and rebuild the temple in Jerusalem. And immediately after that the returnees rebuilt the temple and placed there the temple vessels, what symbolize the restoration of the temple of Solomon. But when the story of Sheshbazzar has been combined with the stories of Zerubbabel it created the controversy. In the story of Sheshbazzar the temple has been rebuilt in the first year of King Cyrus, but in the stories of Zerubbabel it has been rebuilt at the time of Persian king Darius. In order to somehow resolve this contradiction, the chronology of the events has been changed. According to the new chronology rebuilding the temple only began at the times of Cyrus, but did not complete. For some reason it has been delayed until the time of Darius the king, and has been completed in the second (in the sixth, later) year of his reign. Therefore, in the intermediate stage of development of the Sheshbazzar story the rebuilding of the temple by Sheshbazzar has been replaced by laying the foundations of the temple. This interim stage of literary development of the book is reflected in the letters to the king Darius by mention of laying the foundations of the temple by Sheshbazzar. But this event there isn't anymore in the story of Sheshbazzar. Gradually, in the biblical texts Zerubbabel began to displace Sheshbazzar. A new and more popular character Zerubbabel established and rebuilt the temple in Jerusalem. As a result, these two characters became to merge. Already mentioned historian Josephus treated these two characters as one person under the different names. Even today in much of the dictionaries states that Sheshbazzar is another name for Zerubbabel. An example of such an association of the characters is an excerpt from the 1 Esdras. Unlike the canonical book of Ezra, which states that the temple vessels have been handed over to Sheshbazzar, in this book the name of Zerubbabel is inserted before the name of Sheshbazzar, although the sentence is clearly refers only to one person. "And the holy vessels of gold and of silver, that Nabuchodonosor had carried away out of the house at Jerusalem, and had set them in his own temple those Cyrus the king brought forth again out of the temple at Babylon, and they were delivered to Zorobabel and to Sanabassarus the ruler, with commandment that he should carry away the same vessels, and put them in the temple at Jerusalem." (1 Esdras 6:18-19 LXA). Accordingly, the return of temple vessels has been shifted from the time of Cyrus to the time of Darius. But this shifting has been carried out only on those scrolls that became the basis for 1 Esdras. In these scrolls the return of Zerubbabel occurred at the times of king Darius. Therefore, in these scrolls the reference to the bringing of the temple vessels by Sheshbazzar to Jerusalem at the times Cyrus has been deleted. Instead, in the book appeared the story that the temple vessels (which King Cyrus only promised return to Jerusalem but not did it) have been returned by king Darius and have been brought by the exiles who returned at the time of this king. In our canonical book of Ezra the mention of the return of temple vessels at the times of Cyrus had remained, but the story about placing them in the temple there is no more, because according to the new chronology of events the temple did not exist yet. The answer is so much simpler! All important Jewish officials in Babylon were given Chaldean names, e.g. Daniel was renamed Belteshazzar. Sheshbazzar [note the similar form] was Zerubbabel's Chaldean name. As the first chapter of Ezra is set in Babylon, Zerubbabel is referred to by his Chaldean name; and note he is called the Prince of Judah in verse 8. You have mafe a mystery where there is none!